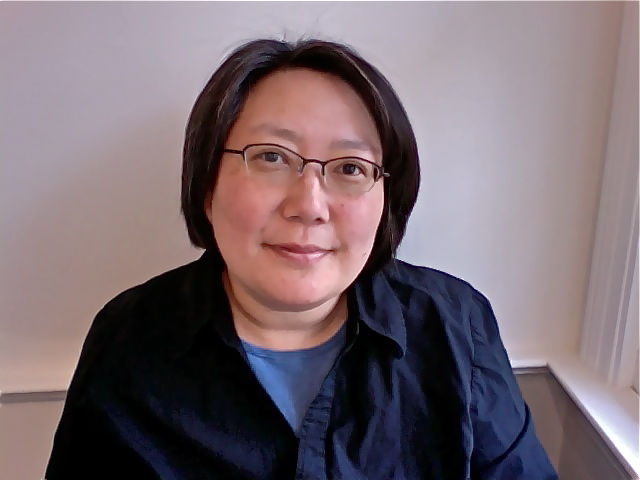 As promised, Janet Wong is my Featured Guest today. It has been fun to work with Janet and Sylvia Vardell on the new e-book, Poetry Tag Time, which you’re about to read about. Janet, the stage is all yours. I just returned from an energizing two days in Houston, Texas, where I was a visiting author at St. John’s School. When Olga McLaren retired from a lifetime of teaching young children at St. John’s, she did an extraordinary thing: she worked to create a poetry endowment that funds poet visits through interest income. Eight lucky children’s poets have been invited so far: Ashley Bryan, Rebecca Kai Dotlich, Kristine O’Connell George, Tony Johnston, J. Patrick Lewis, Naomi Shihab Nye, Alice Schertle, and myself. I have never heard of similar program, and though today’s economy is suffering, I know there are schools and communities that still can afford to do something like this. Mrs. McLaren is not an oil heiress (to my knowledge, though her life clearly is rich); she is simply a woman who is passionate about poetry and was willing to ask, and ask, and ask, to make people believe in poetry—to become a poetry evangelist. The beauty of this endowment is that it treats poetry as a necessary thing, something that families can count on as surely as food in the cafeteria and lights in the gym. How can poetry be necessary, when we have so little time for anything nowadays, much less literature? It is precisely because we are busy and stressed that poetry is essential. Those rare moments when we have time to “take our time,” we’re so wound up we can’t even relax. Hurrying through the week on adrenalin, we can’t help but fidget with our gadgets, texting and checking emails at every opportunity. If only we had some magic something to recharge our energy, to slow the world down while we scurry from school to piano lessons to soccer! We do have something: poetry is the literary equivalent of a shiatsu massage, sending jolts of energy through our nervous systems. Poetry is Jamba Juice, a week’s worth of nourishment packed into an 8-ounce smoothie. Poetry is a vacation for your left brain. With a poem in your pocket—or 30 of them, in an eBook on your cell phone—you (and your kids) can take a 30-second trip to a sandy beach while standing in a supermarket line reading poems about sea turtles. A child whose head is pounding from too much homework and too little sleep can spend five minutes with poetry before bedtime and ease into his world of dreams. It is no wonder that the children I saw at St. John’s were bright-eyed and smiling: they’d been reading poetry all month! An eBook on your cell phone: welcome to reading in the 21st century. No eBook could possibly replace a gorgeous fully-illustrated book and the experience of flipping through its glossy pages. But eBooks are unique in their transportability: you can carry not just 30 poems in your pocket, but a whole shelf of books. With so many free eBook classics and many new books under $5, you can download a mini-library onto a phone or Kindle or iPad for the cost of a pair of shoes. If you are looking for a first poetry eBook to put on your phone, please consider PoetryTagTime, http://amzn.to/e4wwxc , an anthology of 30 poems by 30 of the top children’s poets in this country—including David L. Harrison, of course! Six months ago children’s literature professor Sylvia Vardell and I set a goal: to create a groundbreaking children’s poetry eBook, PoetryTagTime, a book that would make poetry a 99-cent “impulse buy” and bring poetry to people who never had bought it before. The problem with poetry books is that they aren’t reaching enough people. Poetry rarely goes into paperback, and an $18 hardcover collection is too pricey for the average reader. After 3 days of sales, our 99-cent PoetryTagTime had sold over one hundred copies—and some of our readers have even become “poetry converts.” Download PoetryTagTime onto your phone and show it to someone who needs a little pick-me-up. Become a Poetry Evangelist! Most schools would have difficulty establishing an endowment such as Mrs. McLaren’s fund at St. John’s. But here’s an idea that every school can do: eBooks as fundraisers. It costs nothing to put a book in the Kindle or Nook store. Suppose that a school wants to make money for a Poetry Fund. Students could write poems and create artwork for an eBook. A local high school student could merge the illustrations with the Word text, creating a .mobi file. (Or you could hire an eBook formatter; I highly recommend Milos Vasic at www.VasicBooks.com .) A team of fifth graders can become Project Managers and upload the book, priced at $3.99, to amazon.com and bn.com. The Poetry Fund will earn a 70% royalty on each book sold ($2.79), minus a delivery fee (probably under 30 cents). That’s approximately $2.50 earned per book. Suppose 500 children send emails to family, neighbors, friends, and local businesses, asking people to buy the book. Three months later, 1000 copies of the eBook have sold on amazon.com and bn.com, and the Poetry Fund has pocketed $2500. No trees were cut down, no fuel was wasted, the children have had a great learning experience, and a Visiting Poet can be invited to create a lifelong memory for every child at your school. A charitable motive led me to write my eBook Once Upon A Tiger: New Beginnings for Endangered Animals. With this book, I will be raising money to help tigers and other endangered animals (and children will help choose the species that benefit from our efforts). I believe the best way to make responsible global citizens is to create a habit of social responsibility and global awareness when children are young. To this end, a classroom might decide to create their own book of poems and artwork about endangered animals (www.iucnredlist.org is the definitive resource on endangered anmials). If they price their book at 99 cents, they would earn only a 35% royalty (because the 70% royalty is offered only to books priced between $2.99-$9.99 in the Kindle store). Still, if they sold 100 copies, they would earn $34 that could be donated to help protect the endangered animals of the world. You can buy eBooks in the Kindle store on amazon.com or the Nook store on bn.com and read them on your Kindles, iPads, Nooks, or iPhones, BlackBerry phones, Android phones. What most people don’t know is that you don’t need one of those fancy devices to read an eBook. You can read eBooks on regular computers; download the free apps for reading your eBook on a Mac or PC here http://amzn.to/dKazMq . Join the reading revolution! Embrace poetry eBooks! Thirty seconds of poetry on your cell phone, for you and your child as you wait in the supermarket line, might be all it takes to keep peace and sanity in our frenzied world. Janet Wong (www.janetwong.com ) is the author of 23 books for children and teens. Her latest two books, PoetryTagTime and Once Upon A Tiger, are eBooks: www.OnceUponATiger.com , www.PoetryTagTime.com (and www.PoetryTagTime.blogspot.com for daily curriculum connections and poetry tips).